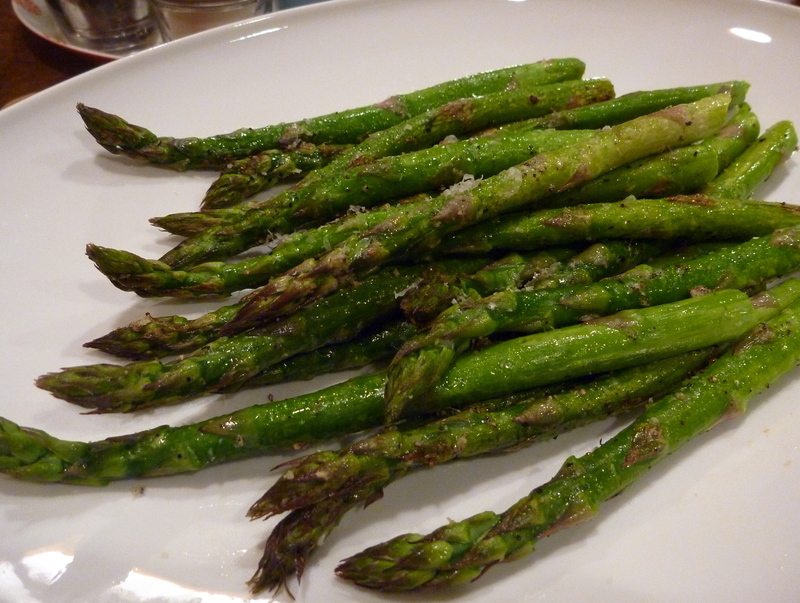 This is, hands down, my favorite way to eat asparagus! Thanks goes to my sweet momma for sharing her simple recipe (Lin-Babes is a total badass in the kitchen). 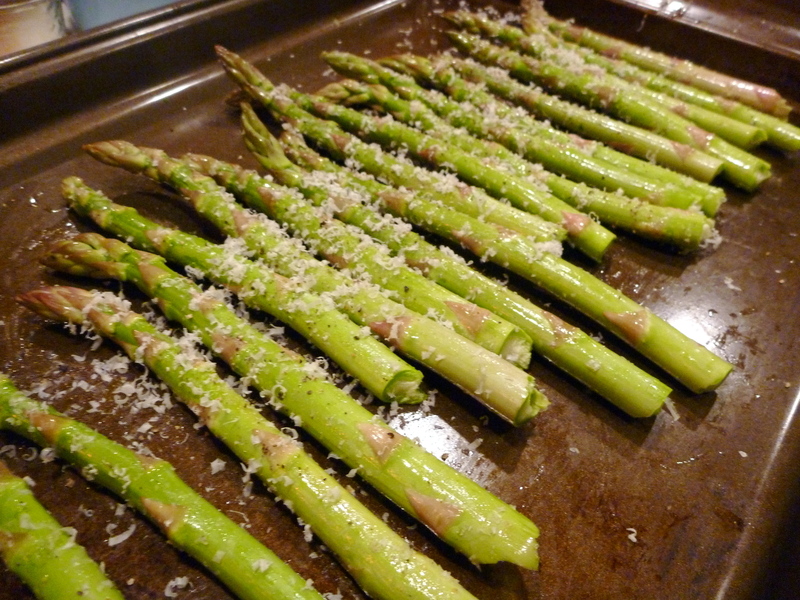 The asparagus is nice and light, but has a little crispy deliciousness from the parmesan that makes it super addictive. We recently had this with the Horseradish-Crusted Salmon recipe from Real Simple. You can bake them both at the same time– the salmon took about 10-12 minutes at 425 degrees. It is a quick and easy dinner to prepare, from the fridge to the table in 30 minutes. Preheat oven to 425 degrees. 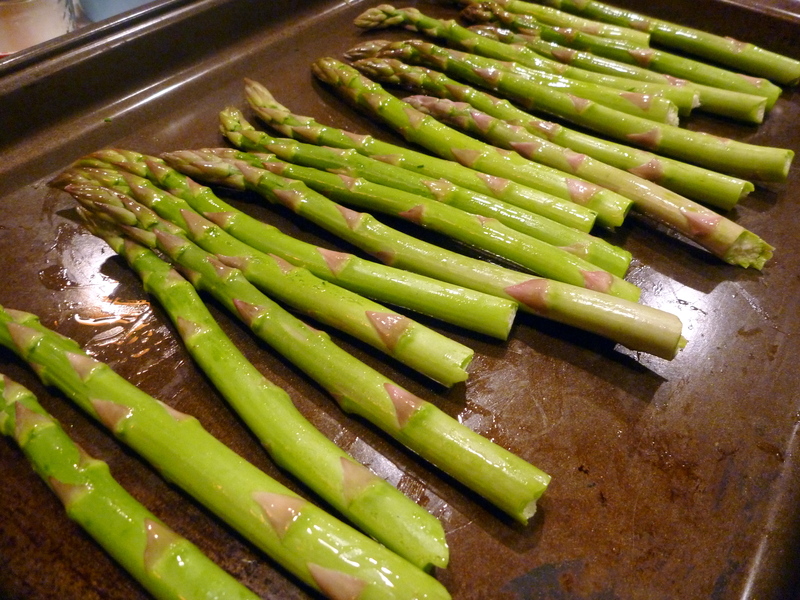 On a cookie sheet, lightly drizzle the asparagus with one teaspoon of olive oil at a time, using as much or as little as you need to lightly coat the vegetables (you don’t want to oil fry them). Roll the asparagus in the oil until it is even. Season with course salt and freshly ground pepper, then sprinkle on the finely grated parmesan cheese (buy pre-grated or use a microplane grater, just make sure it is fine). Roll it around again, so everything is evenly coated. Spread into a single layer, leaving a little room between each spear, so the heat can circulate around it. Roast on the lower middle rack for about 7 or 8 minutes. Take it out of the oven when it is still a bit firm (don’t overcook!). Use a spatula to peel it off the sheet, it should have a nice, slightly crunchy layer on the bottom.